Hamilton County Public Health sanitarians respond to nuisance complaints and conduct inspections and monitoring at landfills and other solid waste disposal facilities within the District’s jurisdiction. A construction and demolition debris landfill (C&DD) is an engineered site for disposing of material from manmade physical structures such as homes, office buildings, etc. They are constructed to reduce risk to public health and safety; include odor, leachate, surface water, fire, and vector (animal and insect) controls; and groundwater monitoring. 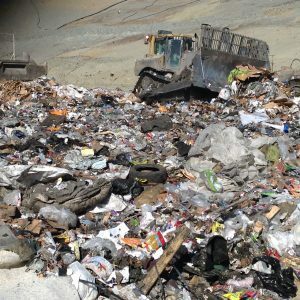 What types of materials do C&DD landfills include? Clean Hard Fill – materials such as concrete, stone, brick, block, and tile which can be reused as construction materials if not disposed of at a construction and demolition debris or solid waste landfill. An Intent to Fill (link to form) notification with the Health District is required whenever these materials are reused as construction fill. Hamilton County Public Health provides regulatory oversight to active waste facilities in Hamilton County. If you have interest in a site, you may contact the Waste Management Division at 513-946-7800. Transfer stations are engineered facilities where small loads of solid waste are transferred to larger vehicles. Transfer stations reduce collection and hauling costs and are constructed to reduce risk to public health and safety. Local and state agencies are currently monitoring a subsurface reaction at Rumpke Sanitary Landfill in Colerain Township. Hamilton County Public Health (HCPH) has been part of a team comprised of Ohio EPA, U.S. EPA, Hamilton County Department of Environmental Services (HCDOES) and Colerain Fire Department – representing Colerain Township involved in monitoring elevated well temperatures and working to remedy the situation. HCPH and HCDOES have a continued presence at the landfill monitoring air quality and investigating odor complaints. Air sampling of the areas surrounding the landfill does not indicate air pollution levels that would pose short or long term health effects. To report an odor complaint 24 hours a day, call 513-946-7777. Hamilton County Public Health has mapped known former landfills in our jurisdiction for which we have limited records. Although this report is complete to the best of our ability and available information, the absence of a site from this map is not conclusive evidence that it was never a dump site or landfill. Users are encouraged to contract with a qualified professional to perform a detailed environmental site assessment prior to purchase or land development upon any site suspected of previous waste placement. If you have interest in a site on this map, you may make an appointment to view the existing records by calling the Waste Management Division at 513-946-7879.